As the first quarter of the year is drawing to a close, I have decided to look back on how my goals and resolutions are going. 1.) Send more happy mail. This goal has been going really well! We have had a lot of "happy mail" to send in the past few months, including birth announcements and thank you cards. 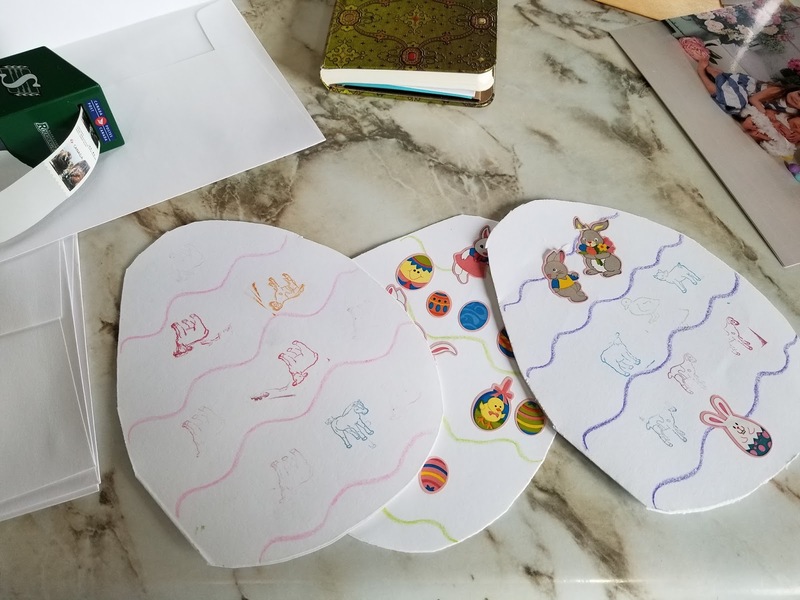 Most recently we sent out homemade Easter cards to family. Miss. E is happy to share her artwork with the people that we love! 2.) Catch up photobooks. This has not happened yet. 3.) Upload photos monthly. I have really stuck to this. I find it so much easier to make our photobook as the year progresses. 4.) Organize blog and implement changes. This has yet to happen, as well. 5.) Embrace frugality. This is coming along. I have been trimming our budget. Hubby and I have decided to do a no spend April. I haven't felt a big urge to spend money on myself since ending my no spend year, which has been very helpful! I am excited to see how a no-spend month goes as a family. My word of the year was adapt. This has gone well. There is always a curve when your life changes for any reason. I think that knowing my life was going to be different and that I would have to be flexible has really shaped my mindset for the year. Things have been going well and I am learning just roll with the changes. How are your goals going this year? I would love to hear all about it! It's awesome that you've been able to go with the changes of this year, Ashley! I know I have a hard time adapting to new situations. 3/5 goals seems great to me! Thanks for your encouragement, Jess!